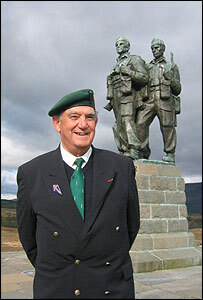 Leon Gautier, 81, was one of the 177 French soldiers to take part in the landings at Sword, as part of the elite commandos under Lord Lovat in the 1st Special Service Brigade. Leon: "No-one even noticed the wet"
I live in Ouistreham, Normandy, about 400 yards from where we landed and I walk there with my dog. But I don't think about it any more. I left it all behind in the war. In July 1940, aged 17, I joined the Navy and came to London. I worked in the East India Docks and then became a machine gunner on a merchant ship. I joined the Free French and went to Africa, and when I came back I trained to become a commando at Achnacarry, near Fort William, in Scotland for five weeks. It was hell. We had to run seven miles in one hour and did lots of close combat. One man was injured by a hand grenade. 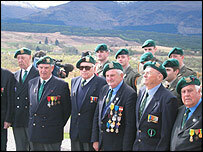 When I and nine other French veterans of 4 Commando returned to Achnacarry for the first time in 61 years, it was very emotional, especially when I met an old Scottish friend. After being picked by Commander Kieffer to wear the famous green beret, I met Dorothy Banks, an English telephone engineer working at an Army headquarters in Dover, who later became my wife. At 5pm on the night of 5 June 1944, 4 Commando left Warsash in Hampshire and waited near the Isle of Wight. We began crossing the Channel at 10.30pm and the mood was apprehensive. We were thinking about what would happen in the morning. We knew we had a job to finish and our British friends had a great spirit. We were proud to say we were with the British and they said the same. At 6am, we could see France. Seeing my country after four years away was very emotional. That was a great honour and we thanked him very much for giving us the opportunity. We landed on the Normandy beaches at 7.30am. I was carrying four days of food and ammunition - pack weighing 30-35kg which we left on the beach, to pick up later. I had to go into the dunes and take on the German defences. We were being fired at but we had a job to do and didn't think about the danger. We don't even remember being wet. Ten men were killed that day and 36 were wounded and evacuated, including our commander, Kieffer. Unfortunately I lost a friend there. He just had time to see France and die. Everybody had believed they would come back. It took four hours to conquer the town and by 11.30am, Ouistreham was liberated. Next we went two miles inland to Pegasus Bridge where we spent one month until Caen was liberated. I was back after four years away. The French people were happy to see us and put their flags out. But after I was demobbed, I couldn't get any accommodation and returned with my wife to England and lived in Dover. Years later, we moved to Normandy and as president of the French branch of the Association of Commandos, I was often going to Ouistreham. The French are sometimes forgotten at D-Day but they forget more in France than they do in Britain. Now my grandson is in the French special forces and I'm very proud of him because he's doing well. "I lost a friend. Everybody had believed they would come back"
What if D-Day had failed? How did D-Day change the world?